Big BIG FINISH Week: Doctor Who Unbound - MASTERS OF WAR Review | Warped Factor - Words in the Key of Geek. Back in 2003, Big Finish celebrated Doctor Who's fortieth anniversary with an unlikely series of releases that explored the “what if?” scenarios of the Doctor Who universe. Called Doctor Who Unbound, the series had a number of successes including Sympathy For The Devil, which starred David Warner as an alternative Third Doctor alongside Nicholas Courtney's Brigadier Alistair Gordon Lethbridge-Stewart (albeit one who had faced down alien invasions without the Doctor by his side). After five years of delay, the duo returned in December 2008 with Masters Of War which not only took them away from Earth but also facing up against the Doctor's greatest enemy: The Daleks. Told across two CD-length acts, versus Sympathy For The Devil's sole disc, Eddie Robson's script for Masters Of War is an epic tale. Opening with Warner's Doctor and the Brigadier arriving on Skaro in which they discover the Daleks occupying the Thal's city, the story starts off as typical Doctor Who fare of rebels rising up against an oppressor. It also sets up much of the Unbound ground work including the history of the Thals and the Daleks which is slightly but significantly different from the what we've encountered on TV. Yet the first disc is literally only part of the story. It's only at the end of the first disc that the truth of the Dalek's occupation is revealed, changing both the stakes and narrative gears for the second disc. It's here that the story shifts away from rebellion and towards being an epic battle with the fate of Skaro at stake. 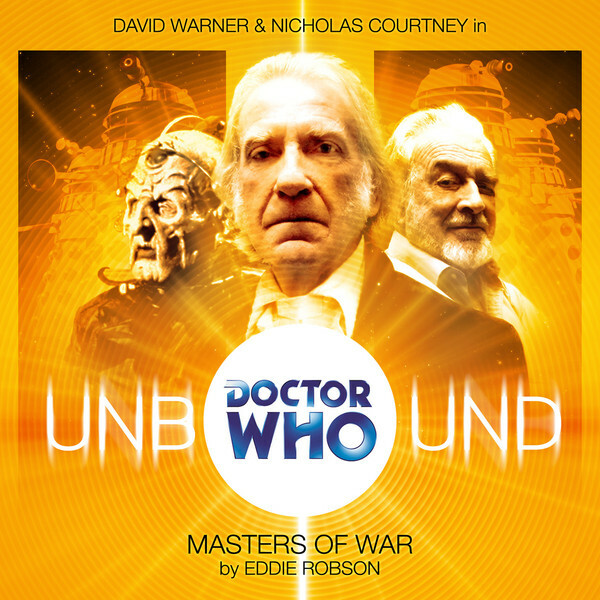 Much like Sympathy For The Devil before it, Masters Of War comes across here especially less as an audio and more like a big-budget epic movie thanks to the fact that Robson seems to instinctively grasp the potential of the Unbound range as he plays around with Dalek history, ideology and indeed the characters we think we know so well after all these years. Not only does it feel like a big budget movie but it sounds like it as well. Martin Johnson's work on both the sound design and the score give the entire proceeding a grand scale, especially in the second disc where battle sequences rage among character moments. Johnson's score in particular (presented as a separate music suite at the end of disc one) feels like a full on orchestral score worthy of any major blockbuster movie. The sound effects too capture that quality, from Daleks roving around cities to crowd noises, explosions and even spaceships in flight. In a way it presents a quality that Big Finish does at its best, occasionally fails to capture but elevates their productions when they do get it right. It's also helped by some fine performances. Warner builds on his earlier outing in Sympathy For The Devil to become a Doctor in full control of his senses and making up for lost time, and with a terrific wit to boot. Backing him up is Courtney's Brigadier playing the role in a way we could only see in an Unbound story: a previously failed army officer finding redemption on an alien battlefield far from Earth, and in fine form as well. The icing on the cake is Molloy's Davros and Nicholas Briggs playing the Daleks who are both given a chance to be something different and they take the opportunity to shine, especially in the second half of the story. As much of an epic as it is, it never lose sight of its characters and, thanks to the performances, some of the character moments are the biggest highlights. Once the battle is over, it's time to leave, but not for everyone. There is a lovely scene at the story's end between Warner and Courtney which illustrates beautifully the difference between the two men, of how one is on a mission to make up for lost time while the other believes that they've atoned for their past. Though it feels this way very much in retrospect, as Masters Of War represents one of the last times Courtney played the role, it's a scene that amounts to something of a farewell for the the Brigadier and which stands in tribute to both the character and the man who brought the role to life. It may have taken five years to make, but Masters Of War was certainly worth it. From top-notch performances to an excellent script, it's not only a worthy successor to Sympathy For The Devil but it also ranks well amongst Big Finish's vast catalog of productions. Though it's Unbound and therefore not canon, if you're willing to listen to continuity get turned on its head for the sake of an excellent story, then this is a tale that will put the familiar into an incredible new direction. It's what the Doctor Who Unbound range did so wonderfully and this release did in particular.